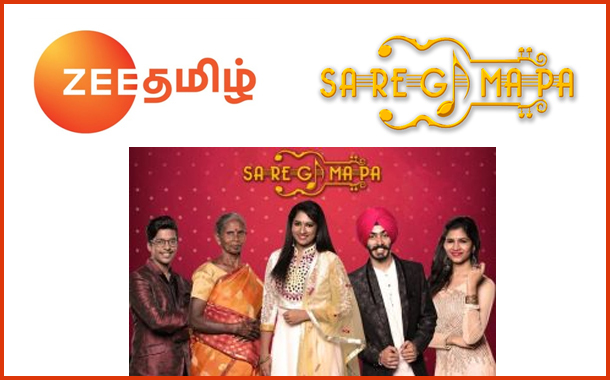 Chennai: The musical journey of Sa Re Ga Ma Pa finally found its destination with the Grand finale after months of enormous competition where Varsha was crowned as the title winner of Zee Tamil’s popular music reality show – Sa Re Ga Ma Pa. The suspense was brought to an end at the ‘Live’ Grand Finale that took place in Jawaharlal Nehru Stadium in the presence of the show’s judges – playback singer and music composer Vijay Prakash, playback singer Karthik and playback singer Srinivas, jury members as well as fans and well-wishers of the contestants. The special guests for the evening included Singer Yuvan Shankar Raja, famous lyricist Vairamuthu, versatile singer Vani Jayaram, Music Composer Santosh Narayanan, Singer Prassana, Actor Sneha, Actor Prasanna and youth icons – Harish Kalyan and Raiza who were in great praise for the extraordinary performances of the 5 finalists. Popularly known as ‘Golden Girl’, Varsha has been presented with over 16 Golden Performances throughout the season. Apart from the title, Varsha was conferred with a grandiose trophy of Sa Re Ga Ma Pa along with the keys to a house worth 40 lakhs. The position of first runners up was bagged by Rockstar Ramani Ammal who was presented with a cash prize of 4 lakhs and agricultural land worth 5 lakhs. Sanjay and Srinidhi jointly bagged the second runners up position and were awarded a cash prize of 1 lakh each. Popular Punjabi Tadka – Jaskaran Singh was awarded the title of ‘Entertainer of the Season’ and was presented a cash prize of 50 thousand. The results were announced by jointly taking into account various factors including the marks awarded by the judges, feedback from the jury members and popular voting by the public. On winning the show – Varsha said, “I had moved to Chennai a few years back to pursue my dream of becoming a singer and showcasing my talent to the world. I am extremely grateful to Zee Tamil’s Sa Re Ga Ma Pa, the judges, jury members and the musicians for giving me the stage and opportunity to realise this dream. The memories that I have made here will always remain as special and unforgettable”. The special moments through the finale was Rockstar Ramani Ammal’s rendition of the super-hit MGR song, Naan Aanai Yittal that was widely cheered on by the audiences and Jaskaran Singh’s performance – Vande Matharam – where the audience members stood in unison and lit-up the auditorium with flash lights. From the inception of Sa Re Ga Ma Pa Season 1 in October 2017, the show has transcended the boundaries of entertainment among the viewers with innovative themes that truly highlighted the mesmerising and melodious voices of the contestants who were handpicked after several rounds of auditions. Since the premiere of the show which featured 25 contestants, the show has travelled a long way with the dedication and commitments of the talented contestants, leading to grand finale with 5 finalists. The Grand Finale was hosted by high-spirited Archana Chandhoke and the actor Deepak Dinkar on 14th April 2018, which was telecasted live for all Zee Tamil viewers around the world.